The current headlines in the energy market are being created by simple supply and demand issues. There is simply no reason for the price of US crude to be as high as it is given the amount of supply and the lack of demand. Because of this, the WTI September futures market dropped by $2 to $95.56, the lowest price for a barrel of US crude since January. In the metals market, gold is certainly feeling the pressure from all the toing and froing of US economic indicators, as well as the geopolitical ups and downs. We have also seen Chinese demand fall back such that India has regained its position as the world's leading gold buyer. Despite all of this, the precious metal has help up quite well, currently trading up 9% for the year at $1,313. Whilst oil futures saw an initial move higher yesterday, an increase in stockpiles encouraged rumours that US demand for crude is on the decline. With data driving sentiment at the moment, and risk in the Middle East continuing to provide support, CFD traders will be keeping a keen eye on this week's economic figures. Ultimately, WTI closed the session more than $0.30 lower at $97.3 per barrel. Gold has continued to trade just below a 3 week high as weak retail sales figures in America inspired uncertainty over the health of the US economy. For now, it seems that the global macroeconomic picture and geopolitical risk are balancing each other out, with gold continuing to trade around $1,315. The price action in WTI crude reflected yesterday's US supply report; with stockpiles on the rise, the September futures market fell by $0.25 to $97.13 per barrel. The supply line seems sufficient for now, but traders will be keeping a close watch on the Middle East for any threat to the flow of energy. Gold has managed to hold its ground so far this week as investors take stock of multiple economic factors including a strong dollar, conflicts in the Middle East and falling demand in China. The precious metal is currently trading just shy of a three week high around $1,310.3. 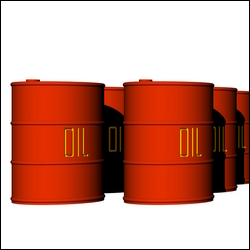 US crude continued its downward trajectory despite a good run over the 3 previous days, with futures falling by as much as 0.3% to $97.80. Given the importance that the energy complex puts on supply factors, investors will be keeping an eye on the fuel-supply data released later today. As the bounce back in equity markets continued, gold fell by 0.2% to close around $1,307. The lessening tension in the Middle East helped fuel global equities, which in turn weakened the demand for gold as an alternative investment. The price of WTI crude oil has risen marginally from Friday's close as US airstrikes have begun to target militants in Iraq, with some fearing that this could be the start of a long drawn out affair. This is certainly going to be an interesting week for oil as inventory data will show whether or not US driving season is still in full flow. Gold is slipping back from its 3 week high as investors take stock of the happenings in the Middle East. Although concerns seem to be fading at the moment, the precious metal will continue to be supported whilst significant geopolitical risk remains.